Every couple of weeks I crave macarons. No, I do not eat just one like a classy Frenchwoman. As my sister and I shout each fall when we see the signs for the Armenian Food Fair here in San Francisco, “FOOD FESTIVAL!” (Must be virtually belched out in a Chris Farley “Van-down-by-the-river” tone.) As in, I eat a lot. I have been obsessed with eating macarons for almost a decade now (yikes! ), but I never tried my hand at actually making them until last year. I am not going to lie. These are not the easiest cookie to make. They are a bit fussy. They take a mixer, a pastry bag or cut plastic bag, and you have to let them rest about a half hour before cooking them. If you make the filling, that takes time too. They are heavenly. To say that a perfect macaron is a treat is an egregious understatement. Being a derivative of the meringue family, the shell is light and soft with a crackly outside. The buttercream recipe that I use here tastes a bit like custard, given that its base consists of egg yolks. The two together are perfect for dessert. Or for an afternoon snack. Or for elevensies. 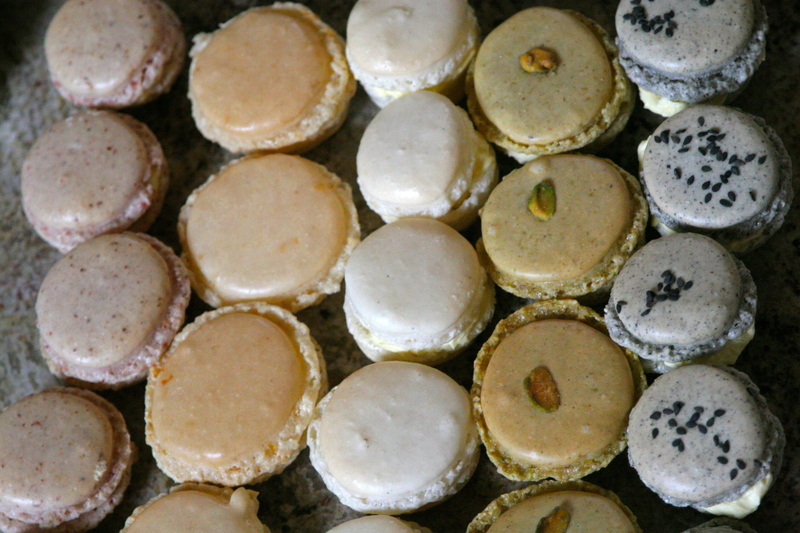 Over the holiday weekend, I made five types of macarons for an Easter get together: Vanilla Bean, Pistachio-Cardamom, Strawberry, Toasted Black Sesame, and Grapefruit. 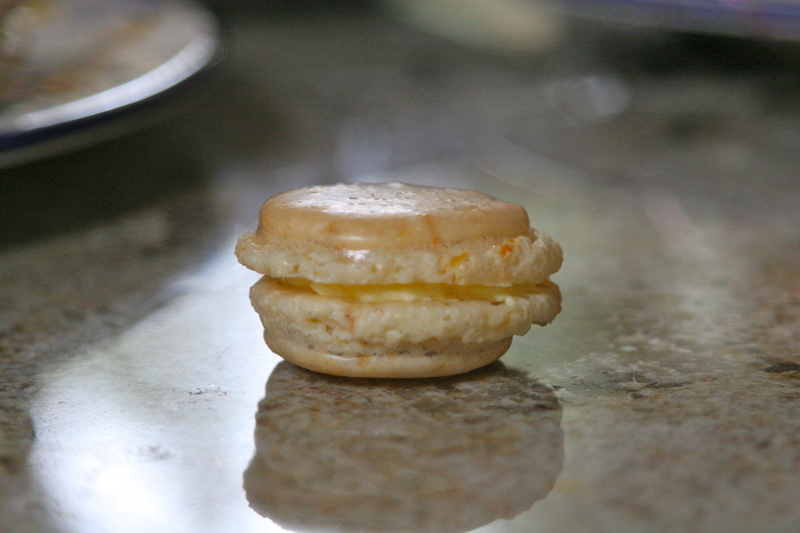 All of them tasted quite different, but for whatever reason, the one that I was most proud of and that I kept coming back to (as did everyone else–I ran out of them before the others), was the Grapefruit macaron. I have been inventing this cookie in my head for a couple of weeks. It had to begin with grapefruit curd. I keep buying the end of this year’s California-grown grapefruit, but my family consumes them all before I have a chance to make it. This time I held aside two grapefruit from the hoarders. 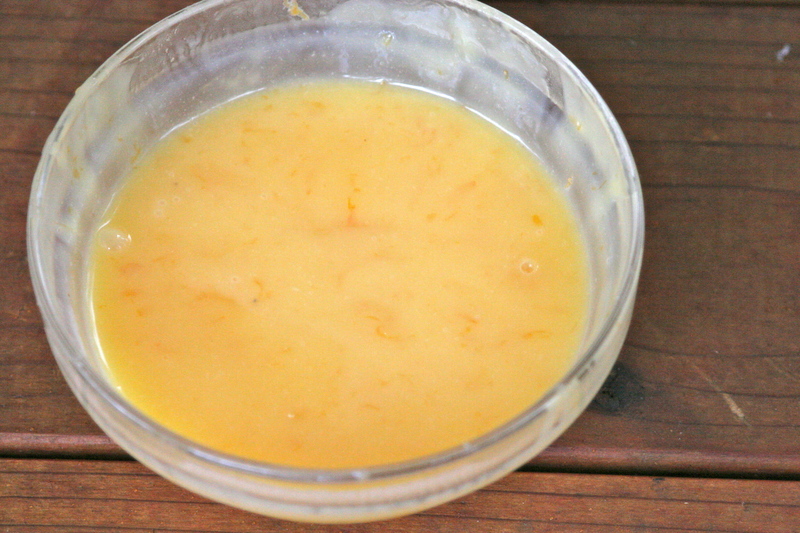 You see, it is not too late to make a lovely batch of seasonal citrus curd. The Meyer lemon trees at our house are still going strong (and often produce well into fall here in San Francisco). If you have never tried making a citrus curd, let alone the good old standby lemon curd, it is really easy and divine. I decided that I wanted a rosier color so I used Ruby Red grapefruit. However, this type tends to have less tang then its yellow counterpart so I added a little Meyer lemon juice as well, just to lively it up. (I had some glorious notions of turning the color even rosier with a little blood orange, but I think their season is long gone and I wasn’t going to fork out three dollars for one Chilean blood orange.) I only used the grapefruit zest so that its flavor would dominate. Put into sterile jars (just boil them for 10 minutes, let dry, and fill), the curd will last several weeks in the fridge so you can use it for lots of recipes (more on that very soon) or just eat it by the spoonful. Now for the macarons. I’ll put everything down below in my recipe, but I do have some tips that I swear by after making these several dozen times. Use a Scale. Be precise with these cookies. If you are off on the measurements they do not bake correctly. Age the Egg Whites. First, do use “aged” egg whites. If you have some left over in the fridge or freezer, you are good to go. If not, simply separate the eggs and leave them in the fridge for at least a day. This dehydrates them ever so slightly. Sift. It doesn’t matter what kind of nuts you use. Almonds, pistachios, walnuts, sliced, whole, blanched, unblanched. What does matter is that you sift out the extra pieces so that all that remains is the floury soft powdered sugar and nuts. I tend to slightly overmeasure everything at the beginning to account for the pieces that I simply cannot pulverize in my Cuisenart, no matter how hard I try. Macronage Baby. “Macronage” is simply the term for how you actually mix everything together. I do between 40 and 50 very quick turns, scraping the bowl each time, until the batter looks like lava. Do not overdo it. To test if the batter is really ready, you spoon a little onto a plate. You do not want it to have a little tip, but instead fall down on itself and smooth itself out. You want pretty flat little circles, not high puffy batter like a classic meringue. Rap and Rest. After you have piped the batter into little circles, rap underneath the pan a couple of times. 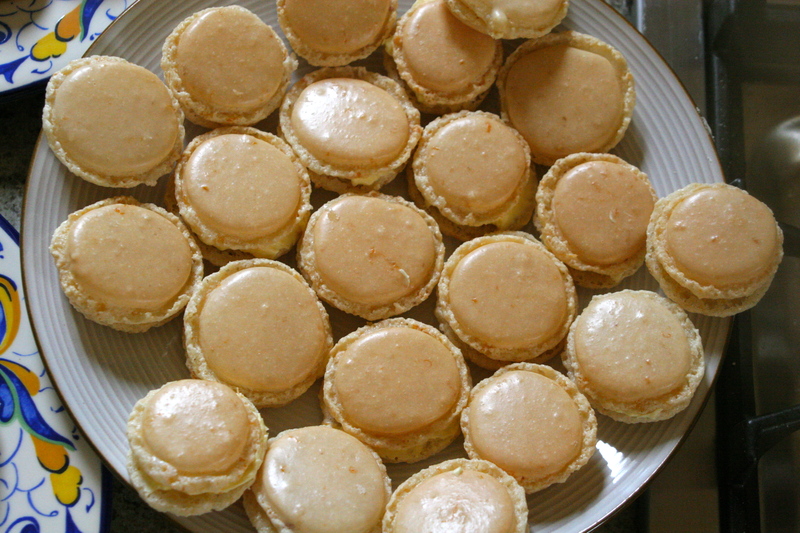 This makes the classic “pie” or ‘foot’ of the macaron and gets rid of any air bubbles. Then just let them rest for at least a half hour and up to two hours so that you have a nice shell when they bake. Parchment Paper. I have never had the problems that I have read about online where cooks cannot remove the macarons from the cookie sheets. I slide the parchment off of the sheet (or sometimes just leave them there to cool if I feel I underbaked them a little) and when the cookie is absolutely cool, I peel them off. No problems. Finally, while these are involved, they are ideal for a day when you don’t have time to make dessert. They are meant to finish in the fridge for a minimum of 24 hours (ideally 48 hrs) and be served from the fridge. I keep coming up with ideas for these guys so expect a lot more soon. And I may post my recipes for the other flavors later on too. There are many different types of fillings, simple jams, cream cheese, plain curd, meringue butter cream, etc. Enjoy this very special treat. 1. In a Cuisenart, blend together the powdered sugar and almonds until they are a fine powder. As I noted above, I actually slightly overmeasure the powdered sugar and almonds to account for the little bits left in the sifter that I cannot pulverize. I snack on them while I bake. You should end up with a mixture that ends up weighing close to 310 grams. 2. Zest the one grapefruit directly into this powdered sugar-almond powder mixture. 3. In a Kitchen Aid type standing mixer, whisk the egg whites until they have risen and are foamy. Slowly add the regular sugar until they gain a glossy appearance. 4. Line two cookie sheets with parchment paper then macronage time. Carefully pour the powdered sugar-almond-zest mixture into the egg whites and with a swift hand, incorporate everything in between 40 to 50 strokes. As noted above, they should resemble lava, which of course, everyone has seen before, right? 5. Line two cookie sheets with parchment paper. In either a plastic bag with the tip cut off of one corner or a pastry bag with an Ateco tip #809 or #807, carefully scrape in all of the batter. Pipe little 1 to 1 1/2 inch circles with a good distance between them so they do not stick together. Give a few raps underneath the sheet to get rid of bubbles and make the “foot” of the cookie (you won’t notice it until it has baked) and let rest in a dry place for at least half an hour. Preheat the oven to 270 F.
6. Bake the cookies in the preheated oven for 18-20 minutes depending on their size. You do not want the tops to darken in color at all, but you want the cookie to cook enough that the outside is crisp while the inside remains chewy. Overbaking is preferable to underbaking in this case, but you won’t really know until they have cooled completely. Do not try to remove from the parchment until they are completely cool. Match shells according to size and then fill with whatever you choose and refrigerate for at least 1 day or until you just cannot wait any longer. Eat all the messy ones immediately. 1. Sterilize some jars in boiling water for 10 minutes (start cold and heat up). 2. Mix the grapefruit zest, grapefruit juice, lemon juice, butter, and sugar in a heatproof bowl over a saucepan of simmering water until the butter has just melted. 3. Meanwhile, whisk the 2 eggs and the yolk together and pour through a fine-meshed sieve into the bowl with the grapefruit mixture and whisk constantly, until it thickens (about 8 minutes). It should have the consistency of cold cream. Pour into your dried, sterilized jars and let cool. 1 1/2 sticks room temperature butter, cut into tablespoons. 1. Heat the sugar and water in a pan until it reaches 238 F.
2. Meanwhile, whisk the egg yolks in a mixer until they are pale yellow and fluffy. 3. With the mixer on medium speed, add the boiling syrup and whisky until completely cool. 4. Take out the whisk attachment and switch to paddle. Add the butter one tablespoon at a time until all is incorporated. 5. Add a couple of tablespoons of grapefruit curd, to taste and mix completely. 6. Fill your macarons and refrigerate them. This entry was posted in Almonds, Cookies, Dessert, Jams and Preserves, Recipes for Egg Whites, Recipes for Egg Yolks and tagged almond meringue cookies, egg white recipe, egg yellow recipe, Grapefruit cookie recipe, grapefruit curd, grapefruit macaron, macaron recipe, ricetta per gli albumi, ricetta per rossi delle uova. Bookmark the permalink. 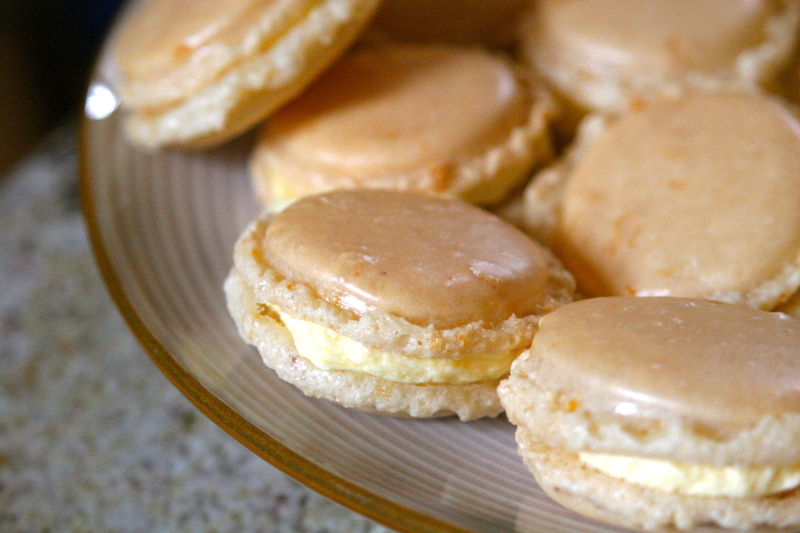 7 Responses to Grapefruit Macarons with Grapefruit Curd or Macaron Madness!!! Who’s the hot macaron piper? Holy macaron! Grapefruit – what a truly creative flavor. I am salivating thinking of how they must taste with the tanginess of the citrus cutting through the sweet. 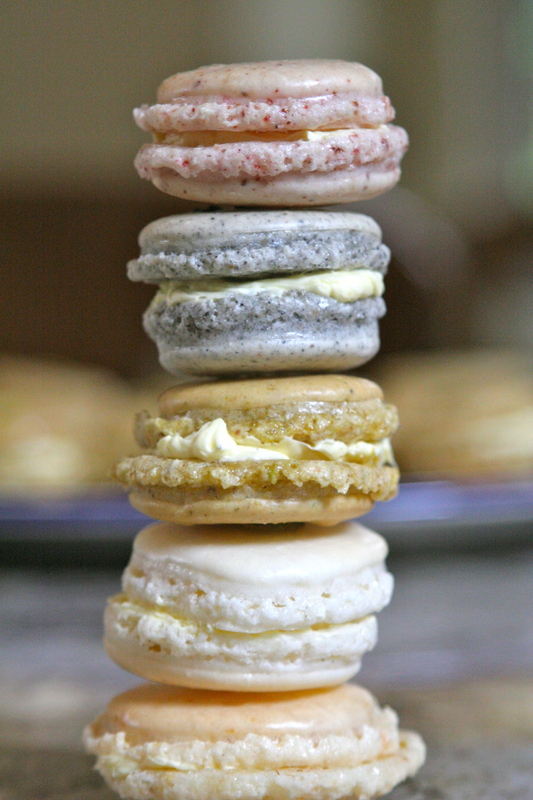 Next time you make macarons, can I please partake? Foooood festival! I cannot wait to try these out on you. Maybe one of the cookies for the wedding? You gave me the courage to finally try to make macarons. My son brought some home from Bouchon about a month ago but I was too intimidated to try and make them at home. I didn’t have time to make the grapefruit curd so I ended up making chocolate and raspberry macarons. I hope to try your recipe this weekend. I used all of your tips and they worked really well. I do have one question for you, how much is almond flour at Rainbow? I paid $11.50 a pound at Whole Foods and if I’m going to make them often, I need a cheaper source. How about just almonds? That is why I do not call for almond flour in mine. You just pulverize them yourself. I used Trader Joes’ almond flour once, but I much prefer the fresh taste from grinding my own in the Cuisenart. If you look at my recipe, I have you slightly overmeasure the sugar and almonds so that if you have any leftover large bits when you sift them, you just toss them. 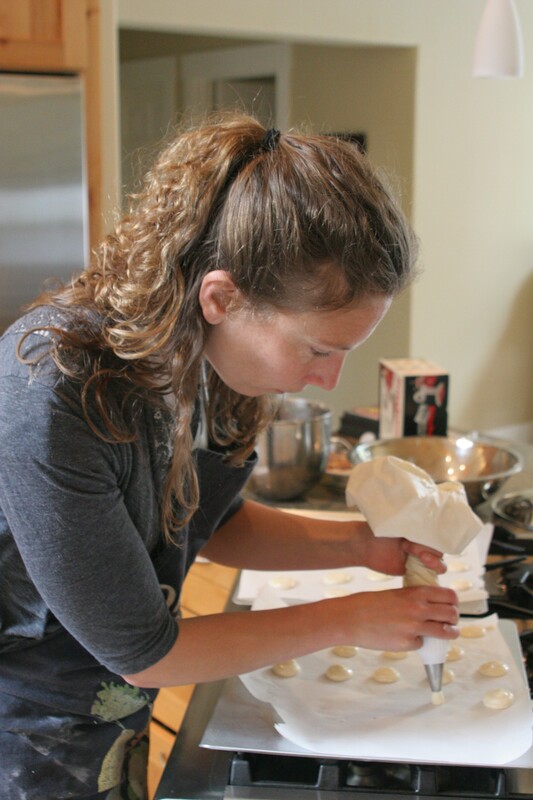 How did your macarons turn out?